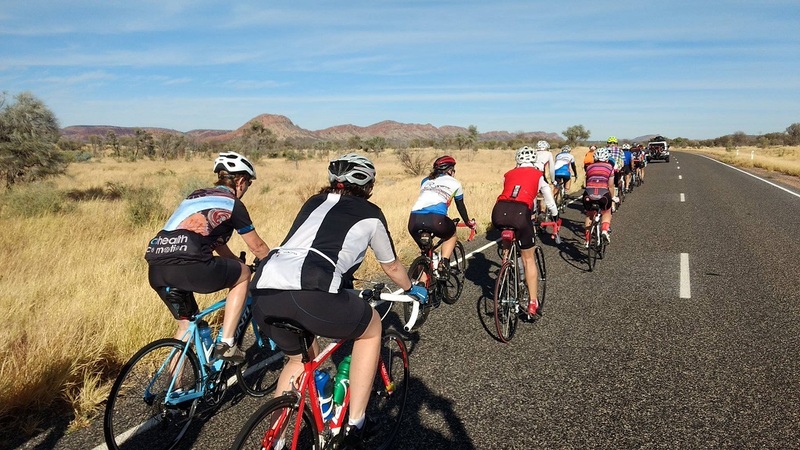 Join members and friends of the Alice Springs Cycling Club on an extraordinary three days of supported, fully catered road cycling through the beautiful MacDonnell ranges from Alice Springs back to Alice Springs, via Glen Helen and Hermannsburg. The distance is just under 400k. Day one is about 135k, day two 115k and day three 130k. Many riders will not have ridden these long distances before, but with moderate fitness and the support of the group, it is definitely achievable! There is also an option to join the WMC just for a single day and night, but you will need to organize your own way home. Note that there is no compulsion for riders to travel the full distance each day. There will always be an option for the bike and rider to travel in a vehicle. Cost of entry is $200 per person for the 3 days fully catered event. Optional day entry is $99 but you must make your own travel arrangements. We meet at the Salvation Army offices on Stuart Tce at 7.00am am on Saturday 4th May for a muffin and fruit breakfast and a send-off from the Salvos and others. The tour will commence at 0745hrs (sharp). It will be cold! Before the tour begins there is a COMPULSORY Briefing Dinner at the Velodrome Club Rooms (Cameron Street entrance) at 6.30pm Thursday 2nd May. Participants are asked to bring a hot dish, salad or sweet to share and the Club provides meat and drinks. Important safety aspects of the ride will be explained and clarified. It is also a good opportunity to meet fellow riders and your support crew. Your swag/tent and small overnight bag will be loaded at this time. Accommodation is camping, and you will need to bring a swag or tent and sleeping mat. Camping facilities have been booked at the beautiful Ormiston Gorge at completion of day one. Bring swimming gear! 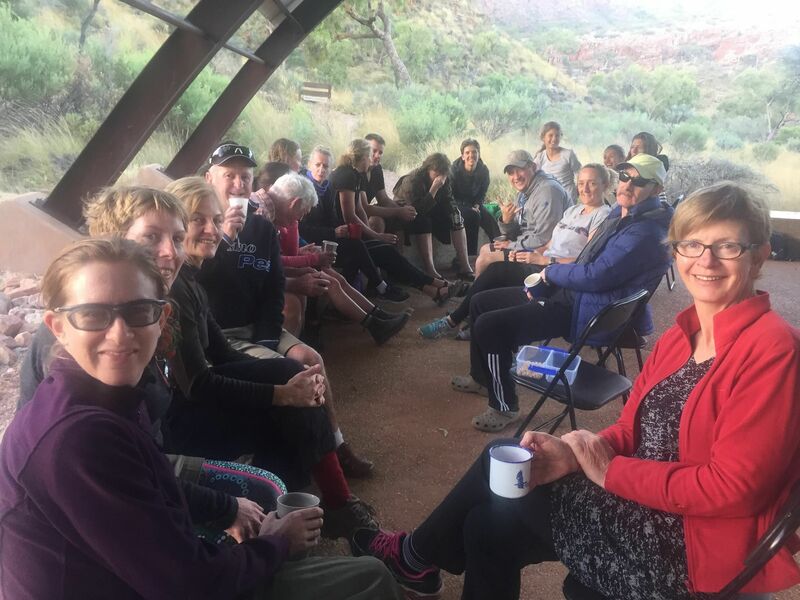 Day two is at the well-serviced Ntaria Campground at Hermannsburg. Note the second camp will be dry as it is in an alcohol-free zone. The tour will finish at the Alice Springs Cycling Club Velodrome, Cameron St, Alice Springs mid- afternoon on Monday May 6th (a public holiday in the Territory). The ride is not a race. It is a controlled ride and cyclists will be required to travel in two groups. If you are not a strong rider and have not ridden in a cycling pack (peloton) then it will be necessary for you to attend ASCC Saturday or Sunday morning rides (or an interstate/Darwin equivalent) prior to the event to develop this skill and to demonstrate you have the required level of fitness. 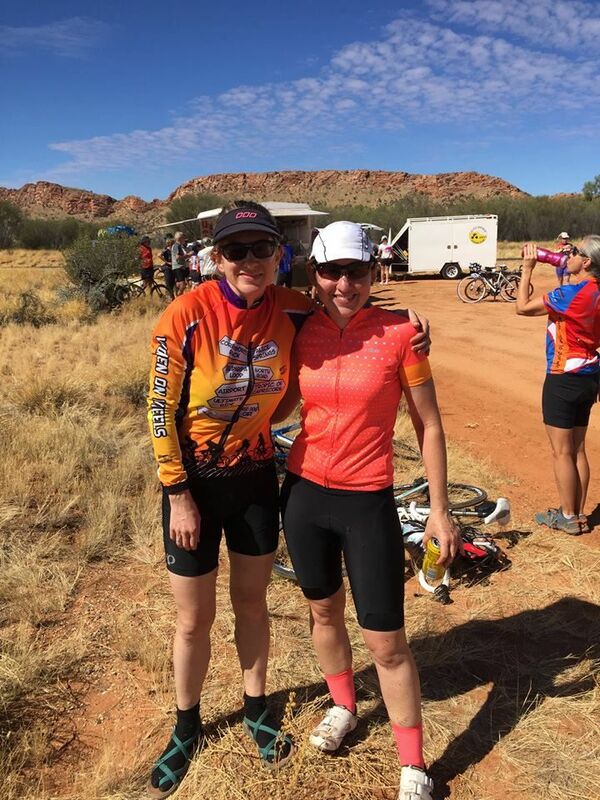 Men and women living in Alice Springs are encouraged to ride with Women On Wheels (WOW) during the week and on Saturday mornings (men are accepted!) and graduate to the Saturday morning Entry Century ride to build up the kilometres. Contact Andrea Martin for details. A Cycling Australia / ASCC Membership is a compulsory requirement for insurance purposes (more details below). Each Rider in the WMC requires a valid Cycling Australia membership. Membership can be obtained by following the link below to the Cycling Australia web site. The minimum membership required is a “Ride” licence (you do not need a racing licence). Please nominate Alice Springs Cycling Club as your registered club. To obtain membership go to http://membership.cycling.org.au If you have a current CA licence please enter this when completing your booking online. Your own small swag, or camping gear, and a small bag of personal belongings such as clothes, toothbrush, towel, swimming gear and your own plate, cup, knife, fork, spoon and a torch. (You will be responsible for your own dishwashing.) A very small day pack can be put on the trailer on Saturday morning. Include your cup for tea/coffee breaks along the way, and a plate and cutlery for lunch times. This small swag and personal bag is taken to the Velodrome Thursday 2rd May to be loaded onto the truck. (Space is limited!). People coming from interstate or the Top End may have to make special arrangements depending on when you arrive. Your bike and riding necessities including at least one water bottle that you carry on your bike. An Australian Standards approved (AS/NZ2063) cycling helmet is compulsory. It is expected that your bike is in good repair and that you carry spare tubes, a pump etc. Personal and equipment insurance is your responsibility. If you wish to stay at the motel at Glen Helen (8k from Ormiston Gorge) rather than camping, YOU must make the arrangements at your cost. Other family members are welcome to accompany as non-riders if they have own transport and can cater for themselves. Or if they volunteer as a driver or tucker helper, the ASCC will cover their costs. A good sense of comradery, humour and willingness to help. ALL MEALS and DRINKS, including morning and afternoon tea. Make sure you let us know your dietary requirements but if you have really special requirements you may need to make your own provision. St John’s first aid kits and a number of people with either St John’s or Sports Medicine qualifications. It is likely a Doctor or two will be riding with the group. A satellite phone will be available for emergencies. There is limited mobile phone coverage in the region. Tour captains will be designated to ensure a safe and enjoyable ride. Please listen and take heed of any instructions from these people. All online prices include credit card fees.